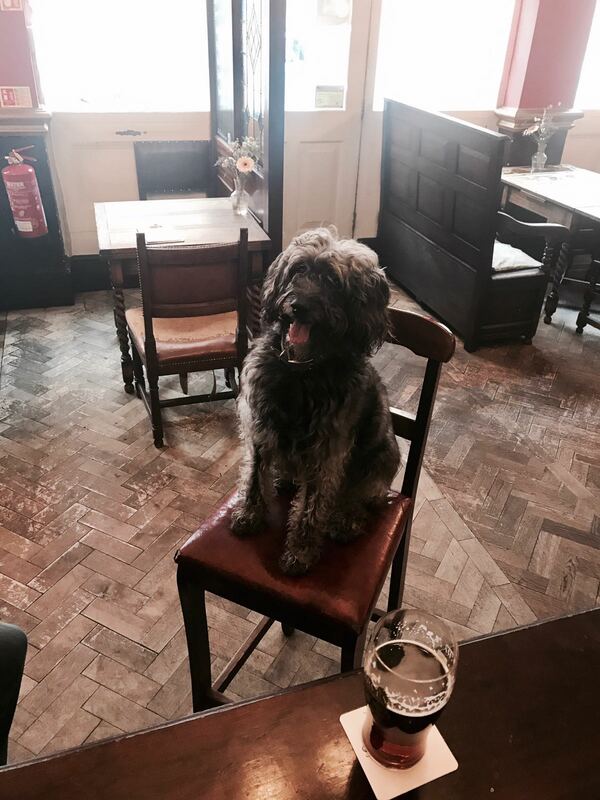 This is Ziggie, a gorgeous Schnauzer Poodle who often likes to sit at the bar and keep me company. The last time owner Lee came in for a pint of Best, people swooned over Ziggie like they always do, asking “what is she? !” after saying just how cute she really is. Lee’s brother in law bred 6 pooches just like Ziggie and still has her mum and sister at home with him in Devon. Born on the summer solstice, its as if she was always meant to light up the room, with her big smile and bundles of energy. Apparently, in Lee’s household, the kids think Ziggie speaks English because she does everything she is told. So it would appear that she is not just a pretty face, and a very clever dog indeed. It is always a pleasure to have both of them in the pub, Lee too, always seems to have a smile on his face. I’m now wondering if Ziggie got it from him, or the other way around. So if ever you find yourself in Wandsworth Park, keep an eye out for Ziggie, who you might just find 6ft up a tree chasing squirrels. Thanks, guys! We’ll see you soon. Previous Get rid of those January blues this Friday at The Cat’s Back. Next Home is where the pub is.